SAN DIEGO - June 23, 2016 - PRLog -- Echosec Systems will be sharing their industry leading social media search solution at the 2016 International Esri User Conference (http://www.esri.com/events/user-conference), June 27-31 at the San Diego Convention Center, San Diego, CA. Visitors to the Echosec booth will have the opportunity to see the latest release of the software, including the newly released Pro and Enterprise offerings as well as something new for the ArcGIS user Community. Echosec will be at booth Z6 in the Startup Zone.The information from Echosec shows real time social data and includes all publicly available posts, pictures, videos, audio, and check-in locations. 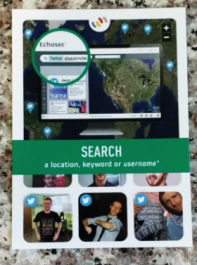 Attendance at the Esri UC will enable Echosec to demonstrate social media awareness as part of the Esri ecosystem. Echosec co-founder Mike Anderson, will be delivering a presentation titled "Discovery and Analysis of Big Data Using GIS". This session will cover collection of big data, and the use and application of analysis tools through ArcGIS to generate solutions to better inform researchers, users and policy makers. The session takes place Wed. June 29, 3:15 PM - 4:30 PM, Room 24 B, SDCC. A number of lucky visitors to the Echosec stand in the exhibition hall floor will walk away with limited edition Echosec Collectible Trading Cards. Get some fun social media tips, tricks, facts and trivia - trade them with your friends and enjoy the gum too! Echosec is the next generation of search that connects you with billions of pictures and posts made by millions of people, which never normally make it to common search engines. Echosec is the first search engine of its kind to realize that 'where' matters as much as 'what'. The unique way of harvesting and displaying dynamic and user-generated content from sites like Twitter, Foursquare and Instagram, gives Echosec a completely unfiltered and real-time view of the world. Echosec has become an indispensable resource for public safety, government, and brand managers looking for information on global events. Defence and security applications for Echosec technology are extensive.